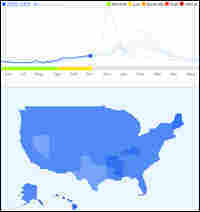 Flu-gle : Blog Of The Nation Tracking the flu, thanks to Google. If you've been listening to our segment with New York Times reporter Miguel Helft on his Google Flu Tracker story, I bet you're here trying to figure out where the heck that darn flu is now. Click on the graphic above, and you'll go straight to the nifty little Google site. And guess what? Hawaii may be paradise, but plenty of paradise residents are at least searching about the flu -- not so much in Nevada (or maybe they're just tougher, and don't need any Google to clear up their symptoms!) See? Grass is always greener.